"ERCP" redirects here. For embedded Rich Client Platform, see IBM Lotus Expeditor. Duodenoscopic image of two pigment stones extracted from common bile duct after sphincterotomy. 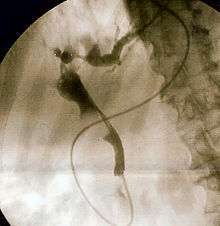 Endoscopic retrograde cholangiopancreatography (ERCP) is a technique that combines the use of endoscopy and fluoroscopy to diagnose and treat certain problems of the biliary or pancreatic ductal systems. Through the endoscope, the physician can see the inside of the stomach and duodenum, and inject a contrast medium into the ducts in the biliary tree and pancreas so they can be seen on radiographs. 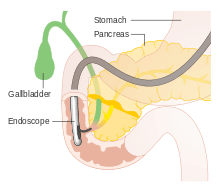 ERCP is used primarily to diagnose and treat conditions of the bile ducts and main pancreatic duct, including gallstones, inflammatory strictures (scars), leaks (from trauma and surgery), and cancer. ERCP can be performed for diagnostic and therapeutic reasons, although the development of safer and relatively non-invasive investigations such as magnetic resonance cholangiopancreatography (MRCP) and endoscopic ultrasound has meant that ERCP is now rarely performed without therapeutic intent. Fluoroscopic image of common bile duct stone seen at the time of ERCP. The stone is impacted in the distal common bile duct. A nasobiliary tube has been inserted. Fluoroscopic image showing dilatation of the pancreatic duct during ERCP investigation. Endoscope is visible. The patient is sedated or anaesthetized. Then a flexible camera (endoscope) is inserted through the mouth, down the esophagus, into the stomach, through the pylorus into the duodenum where the ampulla of Vater (the union of the common bile duct and pancreatic duct) exists. The sphincter of Oddi is a muscular valve that controls the opening to the ampulla. The region can be directly visualized with the endoscopic camera while various procedures are performed. A plastic catheter or cannula is inserted through the ampulla, and radiocontrast is injected into the bile ducts and/or pancreatic duct. Fluoroscopy is used to look for blockages, or other lesions such as stones. When needed, the opening to the ampulla can be enlarged by a cut (sphincterotomy) with an electrified wire called sphincterotome and access into the bile duct obtained so that gallstones may be removed or other therapy performed. In specific cases, other specialized or ancillary endoscopes may be used for ERCP. These include mother-daughter and SpyGlass cholangioscopes (to help in diagnosis by directly visualizing the duct as opposed to only obtaining X-ray images) as well as balloon enteroscopes (e.g. in patients with post-Whipple or Roux-en-Y surgical anatomy). The major risk of an ERCP is the development of pancreatitis, which can occur in up to 5% of all procedures. This may be self limited and mild, but may require hospitalization, and rarely, may be life-threatening. Those at additional risk for pancreatitis are younger patients, females, patients with previous post-ERCP pancreatitis, procedures that involve cannulation or injection of the pancreatic duct, and patients with sphincter of Oddi dysfunction. Intestinal perforation is a risk of any gastroenterologic endoscopic procedure, and is an additional risk if a sphincterotomy is performed. As the second part of the duodenum is anatomically in a retroperitoneal location (that is, behind the peritoneal structures of the abdomen), perforations due to sphincterotomies are retroperitoneal. Sphincterotomy is also associated with a risk of bleeding. There is also a risk associated with the contrast dye in patients who are allergic to compounds containing iodine. Oversedation can result in dangerously low blood pressure, respiratory depression, nausea, and vomiting. Other complications (less than 1%) may include heart and lung problems, infection in the bile duct called cholangitis. In rare cases, ERCP can cause fatal complications. Cases of hospital acquired infections with carbapenem resistant enterobacteriaceae linked to incompletely disinfected duodenoscopes have occurred in the U.S. since at least 2009 per the FDA. Outbreaks were reported from Virginia Mason Hospital in Seattle in 2013, UCLA Health System Los Angeles in 2015, Chicago and Pittsburgh. The FDA issued a safety communication "Design of ERCP Duodenoscopes May Impede Effective Cleaning" in February 2015, which was updated in December 2015. ↑ Adler DG, Baron TH, Davila RE, Egan J, Hirota WK, Leighton JA, Qureshi W, Rajan E, Zuckerman MJ, Fanelli R, Wheeler-Harbaugh J, Faigel DO; Standards of Practice Committee of American Society for Gastrointestinal Endoscopy. ASGE guideline: the role of ERCP in diseases of the biliary tract and the pancreas.Gastrointest Endosc. 2005 Jul;62(1):1-8. ↑ Tabibian JH, Visrodia KH, Levy MJ, Gostout CJ. Advanced endoscopic imaging of indeterminate biliary strictures. World J Gastrointest Endosc. 2015 Dec 10;7(18):1268-78. doi: 10.4253/wjge.v7.i18.1268. ↑ Tabibian JH, Asham EH, Han S, Saab S, Tong MJ, Goldstein L, Busuttil RW, Durazo FA. Endoscopic Treatment of Post-Orthotopic Liver Transplantation Anastomotic Biliary Strictures with Maximal Stent Therapy (with video). Gastrointest Endosc. 2010 Mar;71(3):505-12. ↑ Farrell JJ, Bounds BC, Al-Shalabi S, Jacobson BC, Brugge WR, Schapiro RH, Kelsey PB (2005). 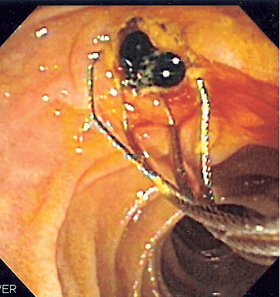 "Single-operator duodenoscope-assisted cholangioscopy is an effective alternative in the management of choledocholithiasis not removed by conventional methods, including mechanical lithotripsy". Endoscopy. 37 (6): 542–7. doi:10.1055/s-2005-861306. PMID 15933927. ↑ Azeem N, Tabibian JH, Baron TH, Orhurhu V, Rosen CB, Petersen BT, Gostout CJ, Topazian MD, Levy MJ. Use of a single-balloon enteroscope compared with variable-stiffness colonoscopes for endoscopic retrograde cholangiography in liver transplant patients with Roux-en-Y biliary anastomosis. Gastrointest Endosc. 2013 Apr;77(4):568-77. 1 2 Andriulli A, Loperfido S, Napolitano G, Niro G, Valvano MR, Spirito F, Pilotto A, Forlano R (2007). "Incidence rates of post-ERCP complications: a systematic survey of prospective studies". Am. J. Gastroenterol. 102 (8): 1781–8. doi:10.1111/j.1572-0241.2007.01279.x. PMID 17509029. ↑ Cotton, Peter B. (2013-05-31). "ERCP (Endoscopic Retrograde Cholangio-Pancreatography)". Medical University of South Carolina (MUSC) Digestive Disease Center. Retrieved 2013-06-09. ↑ Sharon Begley; Toni Clarke (20 February 2015). "FDA knew devices spread fatal 'superbug' but does not order fix". Reuters. Retrieved 20 February 2015. ↑ "Deadly superbug infected patients at Seattle hospital". CBS. CBS Interactive Inc. January 22, 2015. Retrieved 21 February 2015. ↑ "Design of Endoscopic Retrograde Cholangiopancreatography (ERCP) Duodenoscopes May Impede Effective Cleaning: FDA Safety Communication". Medical Devices. US FDA. 19 February 2015. Retrieved 19 February 2015.